See Time Off to Outdoors for more information. 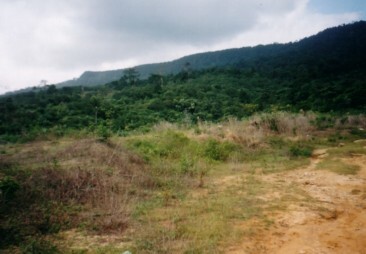 Gunung Panti is a small hill found near the town of Kota Tinggi, Johor. As it is just over an hour of ride away from Singapore and relatively low, it is a good introduction to those who wanted to scale higher mountains in Peninsula Malaysia. Gunung Panti does not have much to offer in terms of view from the summit and the only water supply is the stream near to the starting point. Although there is a gully where there is some water at the first campsite, the water supply is unreliable and not suitable for drinking. However, for the lucky trekkers, monkeys can be seen on the plateau although they are more often heard than seen. Luminous microscopic fungus can also be seen on ground at the summit at the edge of the tent pitching area. However, it can only be seen if the surrounding is dark and it had not rain earlier in the day. Along the way to the starting point of the trek, Gunung Panti can be easily recognized as it is in actual fact, a plateau. The Lukut route is easy without any technical sections and it would lead to the middle of the plateau instead of straight to the summit. This route is also relatively clean and less traveled by both Malaysians and Singaporeans alike. The starting part of the trek is in a fruit plantation. However, after a few minutes of trek, the trail leads into vegetated area although tree cover is still quite sparse. Thus the initial part of the trek can get quite hot. After about half an hour of trek, the trail would lead into the forest. Leeches can be quite common at this lower part of the hill. Nearer to the top of the plateau, the trail would be steeper. But once the top of the plateau is reached, the rest of the way to the summit is relatively flat with only some slight ascent and descent. There are actually two campsites on the plateau. Going along the plateau, the first campsite is reached after about 20mins of trekking. There is a gully near this campsite where there is some water. However, the water here is brownish in colour although it is clear. It is not advisable to use the water here for drinking. The summit is another half an hour trek where the second campsite is located. There is no water at the summit. 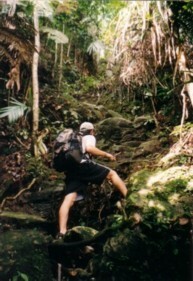 Along the way to the summit, the trail is muddy at certain point. 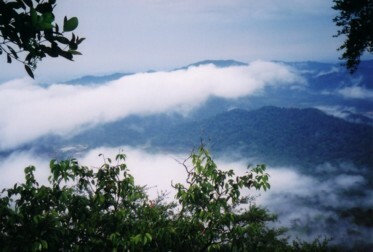 Although Gunung Panti can be covered within a day, it is advisable to spend a night at the summit. Sometimes, the luminous fungus can cover a wide area away from the main camping area. However, they are just luminous and do not glow thus they can be quite difficult to spot. The trail from the Lukut area is also clean due to less human traffic. Gunung Panti trek is a good getaway from the city life without having to rush to get back to Singapore in time. Tell the driver that you are going to Gunung Panti via Lukut. 20 Big rock Trail is behind the rock. 15 T-Junction on top of plateau To summit, go straight.Turn left to see view of the southern part of Johor; End of steep ascend. Note: In 2006, there were reports of big-foot sighting in the region and forest rangers were stationed at the starting point of the trek to check for permits. However, a fellow trekker has kindly informed me that the forest ranger is no longer there. According to a fellow trekker, since the beginning of the year 2006, forest rangers are stationed at the starting point of the trek to check for permits. Mr Koh Hock Lye, Director. Please read Disclaimer, terms and conditions prior to using the data/information on the website.